Sharon Drew Morgen » The New Buying Habits of Buyers: Does solution data drive a decision? It’s so much easier for buyers to buy now. With the click of a wrist, or a jog of a fingertip, they can read about, compare, and purchase whatever they want. So buyer’s behaviors are changing. Or are they? While their capability to attain data, or make the actual purchase is much easier, is their route to their buying decision different? Do you know that point in a buyer’s decision process that they seek this information? And is there other material we could be offering at other points in the buying decision process? 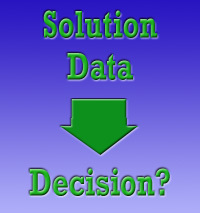 DOES OUR SOLUTION DATA DRIVE THE BUYER’S DECISION? Does our carefully branded data drive our buyer’s buying decision? Well, yes and no. Obviously buyers must ultimately know if your solution fits their needs. But this is the last, the very last thing, that they need before they make a purchase. Think of a house purchase. The very last thing you need is information about the house. First you need to decide to move – and your family might have some really interesting conversations before that decision is actually reached. Then you have to figure out the criteria – neighborhood? school district? travel time to work? /affordable mortgage/price? It’s only when all of purchasing criteria are lined up that you know where to look for a house, the sort of house you need, etc. Think of losing weight. The last thing you need is to know membership prices for a gym. First you need to decide to be a healthy person, change your eating habits, decide to change your schedule – which might involve several family members and the family dog. Before any purchase gets made, an unknown number of internal, private, behind-the-scenes decisions and considerations must be resolved first. And make no mistake: until or unless they are dealt with, the status quo will prevail regardless of the efficacy of the new solution. Indeed, the status quo has been ‘good-enough’ until now, and far easier to maintain than going through whatever change must happen when something new is adopted. When a consumer wants the new iPhone, is it about owning the newest MAC product? Then that person is someone who is an early adopter who has ‘time’ and ‘wizzy factor’ as their major criteria. If someone’s criteria for purchasing a phone is usability, then their 3G phone may suffice. Same product (phone), different criteria, different buying choices. Different information needed. People never, ever, make choices that lie outside of their values or criteria. The pain involved with living with the results of shoving an incongruent element into a working ‘system’ – into accepted beliefs and values, into people’s jobs and relationships and habitual daily activities – is greater than any noticeable need or problem to be resolved. Not to mention that the choices they’ve already made has created their status quo, which has been ‘good enough’ and most likely not facing an emergency situation to change immediately. So while it’s easier, these days, to actually make a purchase, and easier for buyers to get whatever – whatever – data they may need as a way to meet their final choice criteria, all of the new sites, posts, clicks, links, that help the purchaser buy only address that portion of the population just beginning to consider a purchase, or those who have already make their foundational decisions to change and are just needing those final detailed bits. And herein lies the problem: until or unless buyers navigate through all of their decision criteria, they will not buy regardless of their need or ability to press a purchasing button. All of our lead generation is rendered useless if there is a political issue going on between two departments, for example. It’s time to add a new skill to augment the sales process. I know, I know, I’m a hammer running around seeking a nail. But really: would you rather sell? or have someone buy? Take a look at my new learning Modules, and stick your toe into learning bits of Buying Facilitation™. Also I’ll be up in Boston in mid September running a tiny public training (pdf) for those interested in studying with me personally.